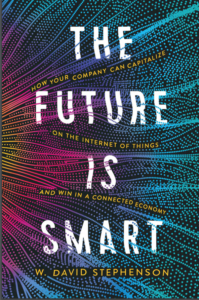 I haven’t posted since the end of October, because I was totally absorbed in writing The Future is Smart, my book about IoT strategy, which will be released in August by AMACOM, the publishing wing of the American Management Association. A major theme of the book is that the IoT lifts what I term the condition of “Collective Blindness” that used to plague us before the advent of real-time data from sensors and the analytical software to interpret that data. Collective Blindness meant that we were frequently operating in figurative darkness, having to guess about how things worked or didn’t without direct observational data, which meant that we frequently didn’t learn about problems inside things until after the fact, which could mean costly (and sometimes fatal) corrective maintenance was all that was possible. Those “things” unfortunately included the human body. Usually the only way to uncover a problem inside our bodies pre-IoT was through costly pre-arranged tests at the doctor’s or a hospital. They could only provide a snapshot in time, documenting your body’s state at that precise moment (when, after all, you might be flat on your back wearing a johnny — not exactly representative of your actual condition as you go about your daily routine!). If you had no complaint warranting such a test, the condition might go undiagnosed until it was significantly worse (remember the contrast between prompt predictive maintenance of a jet turbine and costly emergency repairs when a disaster loomed?). That’s why the news from Brandon Ballinger, the Google alum who was co-founder of the Cardiogram app (get it! I did! and I joined their Artificial Intelligence-driven Health eHeart Study as well!) is so important. 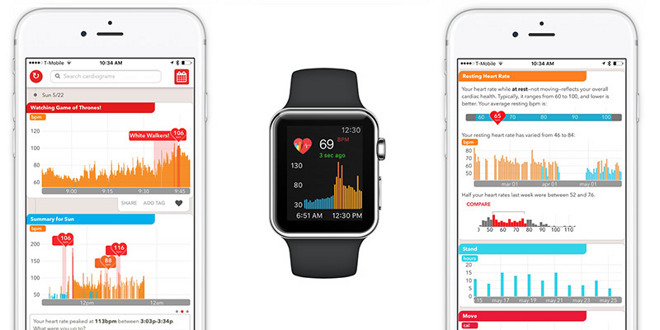 In a clinical study released last week, the research team found that the Apple Watch is 85% accurate in detecting diabetes in those previously diagnosed with the disease. The paper was presented at the AAAI Conference on Artificial Intelligence last week in New Orleans. The study analyzed data from 14,000 Apple Watch users, finding that 462 participants through the heart rate sensor, the same type of sensor. The investigation tested a 2015 finding by our famous local Framingham Heart Study that resting heart rate and heart rate variability significantly predicted incident diabetes and hypertension. We’ve read for several years about single-purpose devices that might be able to diagnose diabetes and determine the need for insulin without painful pinpricks, but the Cardiograph research might show that simply harvesting enough data with a multi-purpose fitness device such as the Watch and being able to interpret it creatively with Artificial Intelligence would be enough. That’s the logical next step with the Health eHeart Study. It reminds me of the example I’ve mentioned several times before of neonatologists from Toronto’s Hospital for Sick Children and IBM data scientists combining to analyze the huge amount of sensor data harvested from preemies’ bassinettes and being able to diagnose a potentially-lethal neonatal sepsis infection a full day before any visible sign of the infection. Given these two examples, one must ask, how many other health problems might be diagnosed in their earliest stages, which cures are most likely and least expensive, if routine monitoring through devices such as the Apple Watch become commonplace and the results are crunched with AI? In particular, this could be a key part of my SmartAging concept. NB: I work part-time for The Apple Store, but am not privy to any strategy or inside information. These opinions are purely my own as an Apple Watch user. Two years ago I created a series of criteria by which to evaluate IoT devices that seniors might use (N.B., I didn’t really focus on ones specifically designed for seniors, because I have an admitted bias against devices with huge buttons or that look like mid-century period tube radios — it’s been my experience that seniors aren’t crying out to be labeled as “different.”) to improve their quality of life. smart home devices to make it easier to run their homes, so that seniors could remain on their own as long as possible rather than entering some drab, sterile assisted-living facility (again, my bias showing…). A lot has happened since I compiled the list. The changes have solidified my conviction that seniors, especially the less technologically minded, might be the acid test of consumer IoT user friendliness because they can’t be expected to work as hard at mastering devices, they don’t have the automatic openness of digital natives, and encounter differing degrees of reduced agility, etc. Also, given the current political climate, it makes sense to try to improve seniors’ lives as much as possible without requiring costly public services that are in jeopardy (I am trying to be civil here, OK?). The most dramatic of these developments is the amazing success of Amazon’s voice-activated Echo. I’ve praised it before as an ideal device for seniors, partially because voice is such a natural input for anyone, and particularly because it means that the tech-averse don’t have to learn about interfaces or programs, just speak! Even better, as the variety of “skills” increases, the Echo really is becoming a unified SmartAging hub: I can now control my Sensi smart thermostats and the “Ask My Buddy” skill can even call for assistance, so it works for both halves of SmartAging. Although I haven’t tested it, I assume much of this also holds true for the Google Home. There’s an increasing variety of other new Quantified Self devices, some of which are specifically focused on seniors, such as the GreatCall Jitterbug Smart phone, which comes with a simplified, over-size home page featuring “brain games” a la Lumosity, and an Urgent Response system (all of these features are available on an iPhone and, I assume, on Android, but must be set in Settings rather than being the default settings). In addition, on the personal level, I convinced my Apple Store (disclaimer: I’m at the bottom of the food chain with Apple, not privy to any policies or devices under consideration, so this is just my opinion) to let me start bi-weekly classes at the local senior center on how to use Apple devices, especially the iPad. I continue to work with a lot of seniors who come into the store who are often leery of tech products. Most directly, last month’s companywide Apple Wellness Challenge was life-changing for me. This year the friendly competition focused on the Apple Watch (important, since a watch is a familiar form-factor to geezers). After wasting three days trying to find the app, I really got into the event because we could share results with friends to encourage (or shame, LOL) them — that really motivated me. Bottom line: I managed to win a Silver Medal, Apple featured my experience on the event website, and, most important, I made lasting changes to my fitness regimen that I’ve sustained since then, now exercising almost an entire hour a day. I couldn’t help think afterward that the program really did show that user-friendly technology can improve seniors’ lives. Does it give you a choice of ways to interact, such as voice, text or email? Voice in particular is good for seniors who don’t want to learn about technology, just use it. Is it easy for you to program, or — if you them give your permission — does it allow someone else to do it remotely? Does it have either a large display and controls or the option to configure them through settings? Does it require hard-wired, professional installation? Is it flexible: can it be adjusted? Is it single purpose, or does it allow other devices to plug in and create synergies? Can it be a true hub for all your IoT devices? Do any components require regular charging, or battery replacement? Is storage local vs. cloud or company’s servers? Is data encrypted? Anonymized? If it is designed to allow remote monitoring by family or caregivers, can you control access by them? Is there major upfront cost? If so, is that offset by its versatility and/or the contrast to getting the same services from a company? Is it stylish, or does the design” shout” that it’s for seniors? Is it “Medical” looking? Is the architecture open or closed? Remote configuration capability (i.e., by adult child)? If so, can the user control amount of outside access? If you’re thinking about developing an IoT product and/or service for seniors I hope you’ll consider the SmartAging concept, and that these criteria will be helpful. If you’re looking for consulting services on design and/or implementation, get in touch! This year, my major suggestion is about a product that it took me a full year to buy after my mother-in-law of a certain age sent last Christmas’s check: never let it be said that I rush into purchases of any kind (I should explain that I’m like the Beacon Hill Brahmin lady who explained to a New York counterpart asking where she bought her hat: “We don’t buy hats. We have hats.” Similarly, I try to avoid buying absolutely anything: I just have what I absolutely need. A strange and complex bird, I am …). The item in question? An Amazon Echo, which, characteristically, I bought refurbished for $50 off! That leads me to a last-minute suggestion for an unlikely use of said Echo: introducing your tech-averse parent to the benefits of smart home and Quantified Self technology (AKA my “SmartAging” paradigm to keep seniors healthy and in their own homes instead of an institution). 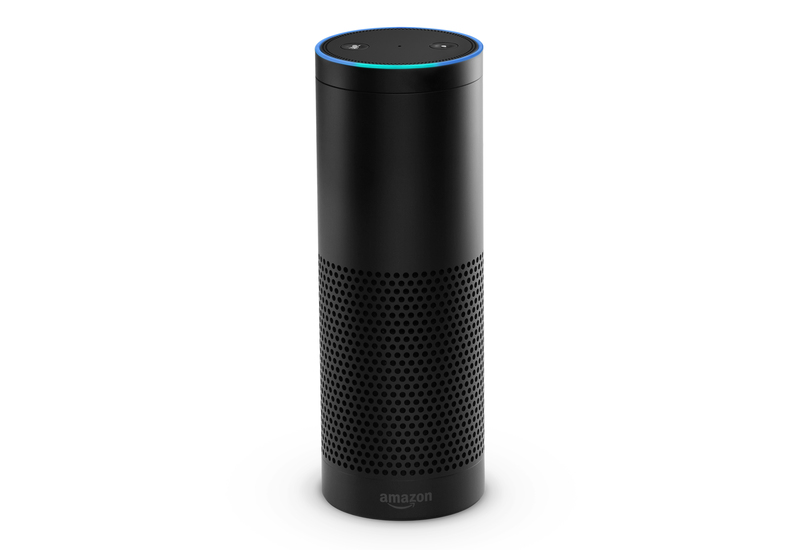 As I wrote a year ago, I think the neatest thing about the Echo in that regard (and, to a lesser extent, other voice-controlled IoT devices, although they’re handicapped because they just don’t have Alexa’s quick response time and already huge and constantly growing list of “skills) is that you don’t need to know any technology to use it: you just say “Alexa:….” and she does it! While I knew the Echo had gone far beyond its original use to stream music, I had no idea until I bought it how robust and rapidly-growing it’s “skills” have become, and that it’s really a full-fledged smart home hub (why buy a dedicated hub that just sits there and doesn’t provide any of the Echo’s other benefits? Got me..). It’s hard to keep up, but a recent Turbo Future article, “Amazon Echo: 15 Best New Features,” gives a pretty good overview, and it seems to me that most of them involve various services that can make it a lot easier, and definitely more enjoyable, for aging parents to continue to live in and manage their homes (although some judicious Christmas morning set-up by adult children may be in order for those seniors who avoid technology like the plague), because all you have to do is talk and listen! They’ll appreciate Alexa even more if their hands are full, which is often the case in the kitchen. shopping lists: my wife doesn’t share my love of gadgetry, but we both love this simple service. Say “Alexa, add flour to my shopping list,” and it’s instantly on the Alexa app on your phone, to pull out at the supermarket. As someone who dutifully makes shopping lists and then always forgets them, that’s worth the service alone. I won’t buy my household staples from Amazon because, despite the savings, I don’t like the ecological impact that specialized service causes, but if that’s not an issue for you, you can order products directly from Amazon using Alexa. ordering services: you can hail an Uber or order a Domino’s Pizza. For a senior who doesn’t have a car, that can be great! music: obviously the prime market for Amazon’s and other streaming music services such as Pandora is millennials, but, guess what, you can even get Guy Lombardo (the soundtrack of my earliest years because of my parents’ 78’s) simply by asking Alexa. The ultimate time machine! books: if you parent has vision problems, audible books may be a boon, and since Amazon now owns Audible, this is also possible. news: I’ve been trying to wean myself from the news since Something Bad Happened Last Month, but I’m still drawn like a moth to the flame, so I can get NPR instantly. A growing variety of other sources are also available. smart home: I just installed two Sensi thermostats as I get deeper into smart home technology on the home front. Even though they have a great app that lets me adjust the temp when I’m away from home, it’s neat to just say “Alexa, turn down the heat two degrees” and have her do the work, not me! Next up? Adding my WeMo lights. cooking: even though you can now get Echo’s little brothers (Dot and Tap) for use elsewhere in the home — or even outdoors — most Echos are found in the kitchen, and nothing is worse than flour-covered hands on a cookbook. Now you can even ask Alexa for a great recipe for a certain dish, use it to make your shopping list, and follow the steps for making the dish, all just by asking her. Neato. calendar: they may not be working anymore, but seniors have got a lot of appointments — the doctor, or my wife’s 95-year old aunt’s tango lessons (I kid you not! ), so if you link your Google Calendar, Alexa will make sure you’re not late. Equally important (and I suspect this will become more of a feature in the near future) the Echo can even help you stay on top of the other part of my SmartAging vision: improving your health, because you can access your Fitbit data. There’s already a skill to help parents with kiddies’ ailments, from our Children’s Hospital, so why not one for geriatrics as well?? That’s just for now, and independent developers are adding new “skills” for Alexa at a dizzying pace. So, if you still don’t have a present for Grannie? Get her an Echo, and since it’s from Amazon, she’ll still get it by the 25th! Came in on end of presentation by Rep. Suzan DelBene, D-WA, co-chair of the House IoT Caucus and an IT industry vet. Her litany of federal inaction in the face of rapidly-evolving tech — especially regarding privacy protections, where the key law was enacted in 1986 — was really dispiriting, although it’s good to know there are some members of Congress who are aware of the issue and working on it. EU Ambassador to the US, David O’Sullivan: the IoT is a “quantum leap” because of combining digital and physical world, and will have huge implications. Europe has created single digital market. Major investments in IoT & funding research on it. Very open research projects. Key is breaking down barriers within the economy. They’re doing research on every aspect of IoT. Priority must be overcoming vertical silos, such as cars and health care. Must balance regulation and innovation. Security and privacy: working on a new set of protections. Dean Brenner, SVP for Gov. Affairs, Qualcomm: everything will need some form of connectivity. Will need new connectivity paradigm. 4G LTE gives solid foundation for cellular IoT growth. 5G will be fully-deployed by 2020. Dr. Rakesh Kushwaha, Mformation (hmmm?) Business Leader, Alcatel-Lucent: securing IoT devices. Tech & standards that are already in place to secure mobile devices can be model for I0T devices: they worked with whole range of devices. Fundamental principle of the security: securely update through device/firmware update package. Only about 40% of IoT will be cellular-based. Alcatel securing vehicle-mounted devices using FW/SW updates. They will launch a project called IoT Connect. Dean Garfield, president & CEO, Information Technology Industry Council: think of security as a design feature, not afterthought. Have to think of it in global sense (including between vertical silos). Chinese government security demands are actually counterproductive. Security can be a differentiating feature. Joseph Lorenzo-Hall, chief technologist, Center for Democracy and Technology: “IoT Spectrum of Insanity” — such as #IoT door locks, require protections be built in. Security by design. He thinks privacy is a bigger factor than security. Stephen Pattison, vp of Public Affairs, ARM. Hacker only has to get it right once. You have to get it right every time! Sensors will have to be very cheap ($5 or less), which will require real creativity. Security will drive acceptability of IoT. Security breaches will be a major risk for IoT companies. Chris Boyer, asst. vp, Global Public Policy, AT&T: different security concerns in each vertical domain. Functional classification determines the risk (for example, some affect interruption on critical infrastructure, or life risk). Virtualize security around the end device. Industry activities: application layers, service layer, network layer, access technologies. Looking 4 acceptable risk management levels. Government procurement standards may drive privacy and security by design. Adam Thierer: are we overestimating how much people really care about IoT security (vs. the “cool” factor??). Gary Shapiro, president & CEO, CSA: he disagrees that you should HAVE to give permission to have your info shared: cites all the benefits of sharing data. Thinks we went overboard with HIPPA & privacy. Announcing agreement on guiding principles for sharing health info from #QS devices. A sense that products will be unwelcomed if they create privacy or security issues: example of an Intel engineer who has vision problems. On a personal basis, his mother had terrible time with Alzheimer’s: he’s upset he won’t have access to a Google face recognition technology. Rob Atkinson, president, Information Technology and Innovation Foundation: “privacy fundamentalists” argue really heavy regulation is way to protect privacy. BUT, no empirical studies underlying that. Pew survey showed few people believe their landline or credit card data will be private, YET almost everyone uses credit cards or phones: i.e., no correlation between people’s belief in privacy of various technologies and their actual use of the technology. Overly stringent privacy regulations will reduce their availability. Much of real value of IoT data is from secondary use of the data, which would be undermined by tough regulation. Way too early to put regulatory regime into place for IoT: too early. Maneesha Mithal, assoc. director, Division of Privacy & Identity Protection, Bureau of Consumer Protection, FTC: two fairly controversial aspects of their 2013 workshop: minimizing data collection debate — said you shouldn’t collect all sorts of data forever, BUT, perhaps collect less sensitive data if they could still derive value. Second issue was “notice and choice.” Tried a middle ground: room for notice and choice, Discussion of regulation: middle ground on regulation: shouldn’t have specific IoT regulation, but should have general, baseline privacy and security protections. We don’t bring “gotcha cases.” Could have program that would provide incentives for self-regulation. Gilad Rosner, Founder, Internet of Things Privacy Forum: “notice & choice” has been the default privacy & security approach for Internet, but it “fundamentally places the burden of privacy protection on the individual.” A presidential group said the responsibility should rest with the provider, not the user. Hallmark of a civil society is being regulated. You can access my “Smart Aging” presentation on Slide Share. Peter Ohnemus of dacadoo, a Swiss company, gave an overview of IoT and healthcare and talked briefly about his company’s Health Score, a 0-1000 score assigned to participating individuals based on their real-time scores on factors including movement, nutrition, sleep and stress. Chantal Worzala of the American Hospital Association gave an overview of issues such as information interoperability and new wellness incentives. Robert Jarrin, senior director of gov. affairs for Qualcomm, talked about some of the policy issues. FDA now has dedicated staff for electronic devices, and they are now not requiring regulatory compliance for some basic devices. Cees Links, ceo, Green Peak Technologies: they are a chip manufacturer, “wireless plumbers.” Shipped 1M Zigbee chips. “IoT is not about things, it’s about services.” “Smart Home should be called a butler.” Confusion about IoT standards: thinks ZigBee & Bluetooth will survive, proprietary standards won’t. Ilkka Lakaniemi, chair, European Commission’s Future Internet Public-Private Partnership Program: working on smart cities strategies, esp. ones that are scalable. Working with NIST on common standards for the demo grants in US & EU. 61 cities involved. Tobin Richardson, president & ceo, ZigBee Alliance. ZigBee, wi-fi & Bluetooth will form basis of a stable ecosystem. Dollar chip is the goal, getting there quickly. Paul Feenstra, sr. vp of government & external affairs, The Intelligent Transport Society of America: evolution over last 5 years from car focus to a really varied multi-modal transportation industry. Shocking how we accept the high death rate & congestion on highways. 80% of crashes could be avoided by connected cars. Ana Sancho, Libellium: they manufacture sensor networks for the IoT. Solve problems from smart cities to agriculture & water resources. More than 90 different sensors. They just see very early testing the water with IoT on part of their clients: not widescale implementation. Perhaps the most important thing about the Mobile ECG is that it is not just a helpful Quantified Self fitness device, but has past the rigors of the FDA licensing process, building both users’ and docs’ confidence in its reliability as a diagnostic tool, and also underscoring that IoT devices can be significant parts of mobile health strategies. As Dr. Albert said to Forbes, ““No one cares whether their Fitbit is accurate or not …. A point of here or there. With ECGs, that’s different.” In 2015 the FDA also approved an algorithm instantly letting you know if your reading was normal. Because of the FDA approval, I put the Alive ECG in that special category of IoT devices and services that are important both in their own right and because of their symbolic role, especially when they meet my test of the IoT allowing “what can you do that you couldn’t do before,” in this case, a self-administered device that isn’t just generally informative about your fitness level, but also gives reliable medical documentation (especially since this allows that documentation to come as part of your activities of daily living, not requiring you to be in the artificial setting of a doctor’s office or hospital). I see it as a critical tool in my “Smart Aging” paradigm. Atrial fibrillation (a common abnormal heart rhythm), the condition the ECG documents, is a huge, and growing, problem. The latest figures I could find, from four years ago, show that people who suffer from it are hospitalized twice as frequently as those who don’t have it, and the annual costs in the US alone are $26 billion. I found the price on Froogle as low as $86 for one to fit a 5s. Sweeeet! Here’s how it works. 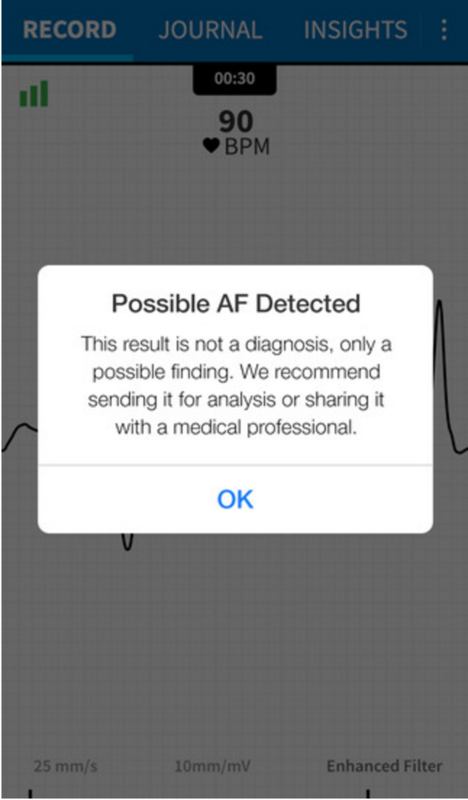 The AliveCor is always available when you suspect you may have a heart problem, because it’s your smart-phone’s case! How brilliant is that? You just rest the two metal pads on your fingers or chest to record an ECG in 30 seconds. 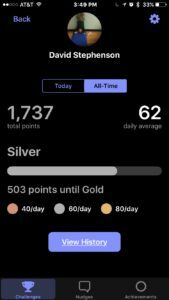 AliveCor has recently beefed up its app by adding the “Heart Journal.” After each reading, you just tap on a Symptom, Activity or Diet tag to add it to your recording, or, like a lot of Quantified Self apps, you can also add in notes between readings about possible indicators such as what you’re eating or your activities. The Beat Fluctuation feature lets you see how your heartbeat changes from beat to beat. 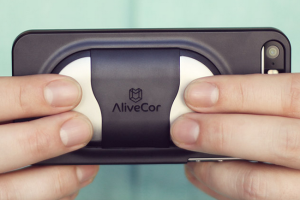 I couldn’t help but think how the AliveCor would have helped me last Winter, when Boston endured the 1-in-26,315-years-Winter-From-Hell (nope: no typo!) . Like everyone else, I was perilously perched on my ladder, 20′ high, sticking my left hand through the ladder to pound away at an ice dam to my right with a REALLY heavy sledge hammer. Unlike many others doing the same thing, I’m old enough (ahem..) that this counted as Risky Business. After several hours, I started to feel chest pain. Two days and many heart tests later, I emerged from the hospital with my own diagnosis confirmed: just a muscle strain caused by the weird position of my hammering. 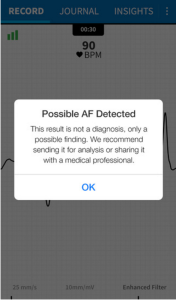 Couldn’t help thinking that if I’d had an AliveCor on my phone, I could have just whipped it out, taken a reading while on the ladder, and, as the web site sez,” AliveCor’s FDA-cleared Normal Detector will determine right away when your ECG is normal,” and gone back to chipping away! *in my defense, I was mesmerized by AliveCor founder Dr. David Albert’s colorful bowties….